I’ve been riding motorcycles for 13 years now, and in that time I have not managed to teach myself to ride a wheelie. Well excuses be damned. Now is the winter of my discontent, made glorious summer by the one wheel ride. I got my first bike when I was 18 because “I’m 18 now and you can’t tell me what to do any more mom!” Ahem, uh, the neighbor down the street had an old Honda CB200T leaning up against a fence. One day I caught him outside and asked him about the bike. He went straight inside and came out with the title saying I could have the bike for nothing if I would push it home. I worked and worked on that bike. It was a lost cause which I ended up pulverizing with a sledge hammer before dragging it to the scrap yard. But the motorcycle dream never died. Over the years I got my hands on more and more bikes, I won’t bore you with the list but you can see some of them here. I cut my teeth on my second bike, a CL100 that I got for $50. I fixed it up a little, learned a lot and rode it everywhere. After that success I was hooked. I’d buy something off craigslist, get it running and riding and then sell it for more after I was done playing with it. It’s a formula that still works for me. I rode my Honda 350 to college graduation. So what about the wheelies? Is this entry just a bragging montage about my motorcycles? No, it’s an admission and a manifesto. 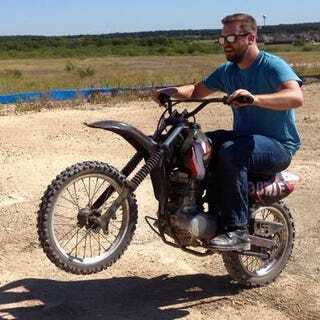 In all that time riding, I never taught myself to wheelie properly. I can rev it up and let the clutch go, but that’s not really what it’s about. What I’m looking to do is conquer that fear that forces my right hand to snap the throttle shut when the front wheel begins to approach the point of awesomeness. I want to build the skills I need to ride an elegant, effortless looking wheelie. I’m not saying I want to terrorize the streets like this, but these guys from Baltimore make wheelies look so easy. So, I’m finally committing to practice until I get it right. Until very recently, as in this week, I was between bikes. I needed some hardware. I scanned craigslist until I found something I could afford. I went in halfsies with a bud, and for $380 bucks we got 200cc’s of Chinese horsepower. I know what you’re thinking, “Ugh, what? Chinese bikes are terrible and under powered with awful build quality and blah blah blah.” To that I have this to say: A, you’re absolutely right, and B, what better bike to hammer daily until I get it right? Nobody will cry if, in my quest for one wheeled glory, I kill a terrible bike. Plus it’s my money, and I’ll do what I want internet! What’s the big deal about wheelies? Well, I guess a psychologist would say that I’m trying to display power, equivalent to a gorilla beating his chest. A Freudian psychologist might stroke their beard and say something about erections. In any case, it’s a skill I want to learn. If Jean-Paul Sarte was right, and we are what we will ourselves to be, I want to be a person capable of pulling and sustaining a wheelie, and I’m gonna do it dammit! Aaron Vick Starnes is an unemployed motor-journalist currently on the road at home chasing the American Dream. Follow him on Twitter @AaronVStarnes and check out the rest of his work.